Bee-Bop Baby makes wonderful fitted diapers! And we received one!! She included a wonderful Thank You note that was thanking me for reviewing her diaper! I love a great company! We received a space print! Organic Bamboo Velour inside! SO SOFT!! Snap out, Double layered soaker! There are only 2 snap down rise settings. and this diaper claims 10-32 pounds. I definitely believe the 32. It gets BIG. But I wouldn't really say 10 pounds. Even now at 12 pounds this diaper is lose around Emerson's thighs. THANKFULLY since it's a fitted it needs a waterproof cover so nothing leaks out. It is a bulky diaper, I can't fit his small covers around this. I definitely need to use a OS cover over this diaper to fit it all in, but no complaints really! It's so soft, a cute fabric and it does fit him pretty good. Just lose around the thighs and I haven't noticed any leaks or compression to the outside of the diaper as of yet. We've used it quite a few times now. No issues thus far! It has crossover tabs to fit skinny waist babies which is fantastic! And it washes up great. The velour is as soft as the day we got it and the fabric hasn't shrunk and is n't faded at all! Overall it's a great diaper! Price: $22! This is fairly reasonable. They are homemade which is so much better than commercial! You know the money is putting dinner on a family's table and not supporting China or companies that pay people $.40 an hour to make something. 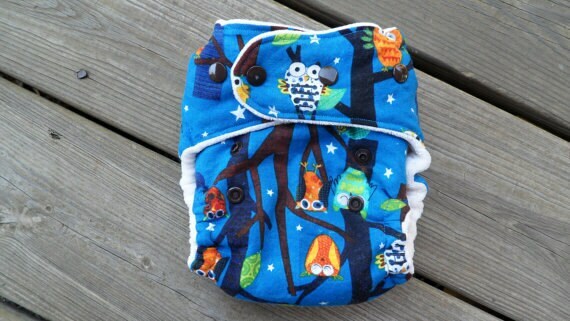 The On a Whim Fitted Cloth Diaper is adorable! I agree. These prints are adorable!!! I love the owls and the aliens print. Koi and Lotus is gorgeous! On a whim is super cute! Love On a Whim Fitted Cloth Diaper! I love the Koi and Lotus dipe! Hard to decide! Either Edgy Veggie or On a Whim! The Koi & Lotus Fitted Cloth Diaper is GORGEOUS! I want it!! I like the Edgy Veggie Fitted Cloth Diaper! I love the On a Whim Fitted Cloth Diaper! I like the On a Whim print diaper. I like the Edgy Veggie print! I love the On a Whim fitted diaper, cute! I love the On a Whim, but from the sold items, I'm crazy about the Care Bears fitted! I love the On a Whim Fitted Cloth Diaper. I like the Gnomes fitted cloth diaper. I LOVE the gnomes print!! My favorite is the Gnomes Fitted Cloth Diaper. I like the Koi and Lotus print. I like the Edgy Veggie diaper! I really like the Gnomes print fitted diaper. I like the on a Whim. Cute. Aliens is my favourite print in the BeeBop Baby fitted diapers. I love the Gnomes fitted! Love the Gnomes Fitted Cloth Diaper. I like the Koi & Lotus. I like the On A Whim fitted. I like the On a Whim Fitted Cloth Diaper! I love the Koi & Lotus Fitted Cloth Diaper! I love the Gnomes print! Thanks for the giveaway! On a Whim Fitted Cloth Diaper. I like the Aliens Fitted Cloth Diaper. I like the Koi and Lotus fabric. I love the Koi and Lotus diaper! The veggies are fun! I love all the prints! I love the Edgy Veggie Fitted Cloth Diaper. I love the Edgy Veggies! Perfect for me, the vegan momma! I like koi and lotus. I really like the Koi & Lotus Fitted Cloth Diaper.